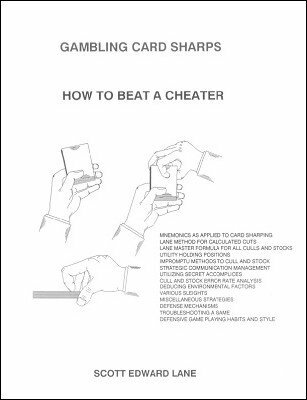 This is a highly sophisticated work on gambling and cheating with cards. The author, Scott Edward Lane, is not only an expert card handler but also an engineer by profession. You will find formulas, flow charts, and graphs which you will not usually find in similar books on this subject. In that sense it is a unique work written by an expert for experts. This ebook details mnemonics as applied to card sharping, Lane System for Calculated Cuts, Utility Holding Positions, Impromptu Systems to Cull and Stock, Strategic Communications Management, Utilizing Secret Accomplices, Cull and Stock Error Rate Analysis, Deducing Environmental Factors, Miscellaneous Strategies, Defense Mechanisms and much more! Much of this book's material is from French Lick, Indiana, the reputed origin of the elusive author of The Expert at the Card Table , by SW Erdnase. The book includes Rhythmic Syncopated Riffling and the true Erdnase Dealing Position. 1st edition 1992, 1st digital edition 2015, 220 pages, 71 illustrations.